Simchat Torah (Rejoicing with/of the Torah) is a celebration marking the conclusion of the annual cycle of public Torah readings, and the beginning of a new cycle. The main celebration of Simchat Torah takes place in the synagogue. The Torah scrolls are read at night. In the morning, the last parashah of Deuteronomy and the first parashah of Genesis are read in the synagogue. 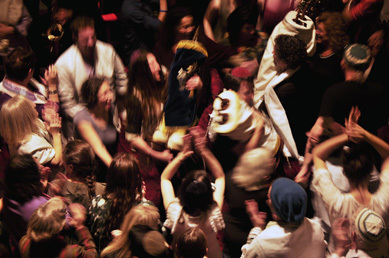 When the ark is opened, worshippers leave their seats to dance and sing with the Torah scrolls in a joyous celebration. Image copyright Leona Strassberg-Steiner.